2008 Honda Civic Pros and Cons | Page 1 of 2 | Why Not This Car? What drives people to buy (or not buy) a certain car? 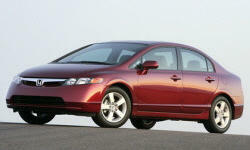 TrueDelta's members share 2008 Honda Civic pros and cons based on their real-world driving experiences. Great car overall, be careful if it snows where you live. Car with high promise, but has failed to deliver on the reliability front. Interior build quality and paint are extremely disappointing. Automatic transmission sometimes struggles to find a proper gear and can get shift happy when at higher cruising speeds. Engine is punchy enough, but I would opt for the Si for better performance. Kind of dated styling, been around this way for years. Honda has a solid reputation for reliability and practicality, even if at the expense of being a bit dull. No deal, no speical offers, one price, take it or leave it attitude - "well, we get plenty of customers in line waiting to buy"
It is modern and aerodynamic without being to nurdy. while I believe it to be rated 34 highway, I typically get 38-40. VTEC - the car just asks to be revved, gives you a race car buzz over 5k rpm. Once broken in, with a gentle, partial, throttle it can be driven from 1500 rpm in any gear (that was 2k+ rpm when new). Pedals are nicely set for heel and toe. Typically bland Honda styling. Nothing overly exciting. They have a well-deserved excellent reputation. I had one several years ago and it just kept going. Sold it with 134k with the original clutch. Replaced the water pump, a dash switch, and the horn in eleven years.